Well, it's the last day at Toy Fair 2008. Today Sideshow announces their newest license - 'Hellboy II: The Golden Army.' 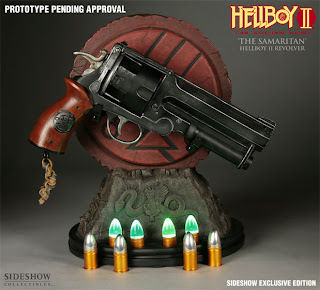 To celebrate they will be releasing a new metal prop replica of The Samaritan, which is Hellboy's famous pistol. Sideshow's exclusive edition of this piece will feature a set of four clear-tipped tracer rounds, featuring green, battery powered LED lights. 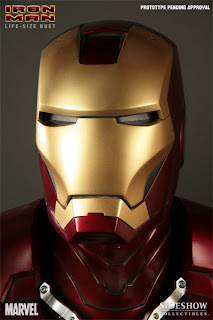 Also on today's list for pre-order release is The Iron Man Life-Size [1:1 Scale] Bust. The bust is cast in high-quality fiberglass, taken directly from the molds used to create the film costume, hand-finished and hand-painted, and features LED glowing eyes. For those of you who missed reading the blog yesterday, the 12 inch Indiana Jones Exclusive Edition figure was completely sold out in record time. However if you are a fan of Harrison Ford & Raiders of the Lost Ark, you may be interested to know that you can still pre-order the regular version of Indy from Sideshow's Web site. You still basically get all the goodies but not the torch or dart accessories. This figure will be one of the first figures to feature the new Sideshow 12 inch figure body.